Founded in September 1975, Multiband Corporation, a Goodman Networks Company, is a driven leader in the competitive service and technology industry, engaging with a vast and growing array of technologies including residential, commercial, hospitality, and digital media solutions. In the Telecom industry, customer service is always important; but for Multiband’s Satellite and Cable Divisions, it is vital, because it determines how they are paid. As the largest DIRECTV master system operator in the Multiple Dwelling Unit (MDU) market in the US, Multiband’s installation and repair services are compensated based on their service performance. Therefore, measuring the right metrics in the right way was essential to profitability. Multiband needed to know how customers were ranking them on several metrics, including customer satisfaction surveys, the number of repair calls, and how many visits were needed to resolve a matter. When it came to measuring performance in their Satellite and Cable Divisions, Multiband found they needed more real-time, accessible data, so they found dashboards. Originally targeted to high-level executives, the dashboards were an integral part of the Business Intelligence Performance Center (BIPC) at Multiband – a central hub for gathering information and insight to make better business decisions and drive performance across a very diverse organization. As part of the BIPC, the adoption rates on this initiative have greatly exceeded the original targets and the dashboards are doing much more than originally intended. 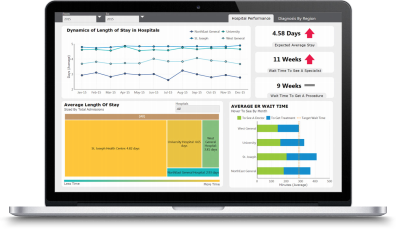 At Multiband the dashboard initiative began as a way to track and measure performance but quickly evolved as a tool that could be repurposed across a large and diverse organization. Dashboards have not only helped Multiband to be an information-driven organization, they contribute strongly to the corporate mission of acting as one team with one voice.